Wait, the Kwik-E-Mart Doesn't Actually Belong Next to the Flanders' House? D'oh! I don't tend to enjoy city-building social games. I try them, and then I end up disappointed in my inability to advance quickly and I end up walking away rather than giving them my money. Clearly, the problem with every previous game I played was that it did not star The Simpsons. 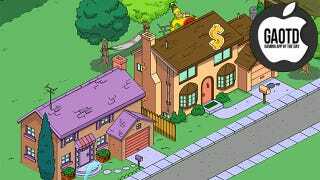 On the one hand, The Simpsons: Tapped Out is a fairly typical city-builder. The player purchases buildings that generate certain levels of income and experience. Characters associated with those buildings can be set to tasks or jobs that also generate certain levels of income and experience. Every task takes a certain amount of time, but can be sped up with judicious application of the game's secondary currency. Certain premium buildings or city installations also require the secondary currency. Some quests reward that currency, or it can be purchased with in-game money or real-world cash. But that secondary currency is the donut, and the city is Springfield. And that actually matters. What has really made Tapped Out a pleasure to play its its self-awareness. Too much attention to the fourth wall can come off as cutesy, cloying, and annoying, but the right amount of self-awareness shows the game doesn't take itself too seriously. In this case, the self-aware style blends well with the Simpsons brand of humor. The opening cut-scene shows Homer playing a Zynga-style city-building game on his myPad, as if to tell us: yes, we are all in on this joke. Let's just have fun with it, shall we? I admit, I stopped watching The Simpsons every Sunday night (like clockwork) a few years ago. But the show and I were together for something like twenty years. (Before you ask, "Treehouse of Horror V" is my favorite, with "Marge vs the Monorail" a close second.) The art and the audio in Tapped Out were enough to draw me in, and the allure of being able to build Springfield the way I thought it should be arranged was enough to keep me playing. Roads, pavement, and the ability to move buildings are all free. So yes, of course, the Flanderseses (stupid Flanders) goes right next to the Simpsons' familiar abode at 742 Evergreen Terrace. But wait! I didn't leave room for the picket fence, or Homer's hammock. That's simple to fix. And as the player levels up and adds more territory to their Springfield, it's helpful to be able to shift buildings around better to reflect where they "should" be. Because yes, I will have to put King Toot's next to Moe's, when I finally get that far. Some things just have to happen. I never thought I particularly cared about the way Springfield was physically laid out, despite all its implausible contradictions. And yet when handed a tool and told to arrange it myself, I can't seem to stop arranging everything just-so. The Simpsons: Tapped Out launched earlier this year for iOS devices but EA pulled it from the market a few weeks later due to excessive demand resulting in lag and instability. It connects through Origin, like EA's other iOS apps. Despite the relaunch, it's still a little slow from time to time, and getting the initial connection to click can be kind of a pain. Once the game has started, however, it runs smoothly, with no delays that I ran into. And it looks exactly like Springfield should, even on my little iPod touch. As of this moment, the listing hasn't yet surfaced on iTunes, but EA announced at Gamescom that it should be back this week. It's worth keeping an eye out for.